The unique properties of tungsten are further enhanced in our tungsten-rhenium wire. Already tungsten wire is a high strength wire and by alloying tungsten with rhenium the strength will be further improved. This is for example a suitable characteristic where the wire dimension has to be the smallest possible in combination with a high strength wire. 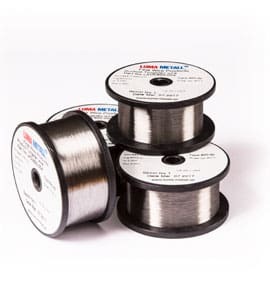 Other characteristics that are enhanced in tungsten-rhenium wire are the specific resistance, as well at the heat resistance and vibration strength. The tensile strength improves ecpecially with temperatures above 500 degrees Celsius (F 932) in comparison to pure Tungsten wire. The density of rhenium is among the highest of all metals and somewhat higher than for tungsten. However, the alloy content of rhenium is rather limited meaning that tungsten-rhenium wire has a density that is almost the same as for tungsten wire. We only offer Tungsten wire alloyed with 3% rhenium. Luma tungsten-rhenium high strength wire is available in the dimension range 0.004 – 0.291 mm (0.00016 – 0.0115″).